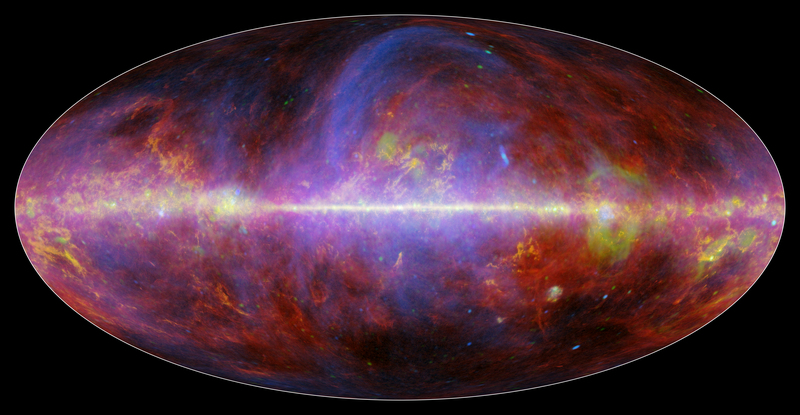 Hot gas, dust and magnetic fields mingle in a colorful swirl in this new map of our Milky Way galaxy. The image is part of a new and improved data set from Planck, a European Space Agency mission in which NASA played a key role. A festive portrait of our Milky Way galaxy shows a mishmash of gas, charged particles and several types of dust. Planck spent more than four years observing relic radiation left over from the birth of our universe, called the cosmic microwave background. The space telescope is helping scientists better understand the history and fabric of our universe, as well as our own Milky Way. “Planck can see the old light from our universe’s birth, gas and dust in our own galaxy, and pretty much everything in between, either directly or by its effect on the old light,” said Charles Lawrence, the U.S. project scientist for the mission at NASA’s Jet Propulsion Laboratory in Pasadena, California. A new, dynamic portrait of our Milky Way galaxy shows a frenzy of gas, charged particles and dust. The new data are available publicly Feb. 5, and now include observations made during the entire mission. The Planck team says these data are refining what we know about our universe, making more precise measurements of matter, including dark matter, and how it is clumped together. Other key properties of our universe are also measured with greater precision, putting theories of the cosmos to ever more stringent tests. One cosmic property appears to have changed with this new batch of data: the length of time in which our universe remained in darkness during its infant stages. A preliminary analysis of the Planck data suggests that this epoch, a period known as the Dark Ages that took place before the first stars and other objects ignited, lasted more than 100 million years or so longer than thought. Specifically, the Dark Ages ended 550 million years after the Big Bang that created our universe, later than previous estimates by other telescopes of 300 to 400 million years. Research is ongoing to confirm this finding. The Planck data also support the idea that the mysterious force known as dark energy is acting against gravity to push our universe apart at ever-increasing speeds. Some scientists have proposed that dark energy doesn’t exist. Instead, they say that what we know about gravity, as outlined by Albert Einstein’s general theory of relativity, needs refining. In those theories, gravity becomes repulsive across great distances, eliminating the need for dark energy. 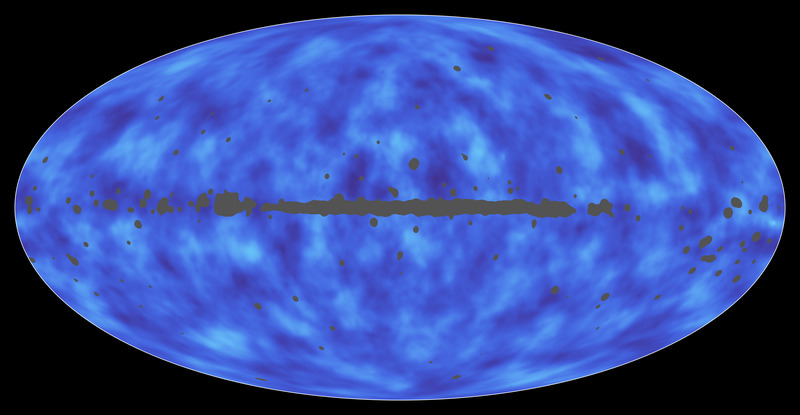 Matter lying between Earth and the edge of the observable universe is shown in this all-sky map from Planck, a European Space Agency mission with important NASA contributions. What’s more, the new Planck catalog of images now has more than 1,500 clusters of galaxies observed throughout the universe, the largest catalog of this type ever made. It is archived at the European Space Agency and, in the U.S., at NASA’s Infrared Processing and Analysis Center at the California Institute of Technology in Pasadena. These galaxy clusters act as beacons at the crossroads of huge filamentary structures in a cosmic web. They help scientists trace our recent cosmic evolution. A new analysis by the Planck team of more than 400 of these galaxy clusters gives us a new look at their masses, which range between 100 to 1,000 times that of our Milky Way galaxy. In one of the first-of-its-kind efforts, the Planck team obtained the cluster masses by observing how the clusters bend background microwave light. The results narrow in on the overall mass of hundreds of clusters, a huge step forward in better understanding dark matter and dark energy. How can so much information about our universe, in both its past and current states, be gleaned from the Planck data? Planck, like its predecessor missions, captured ancient light that has traveled billions of years to reach us. This light, the cosmic microwave background, originated 370,000 years after the Big Bang, during a time when the flame of our universe cooled enough that light was no longer impeded by charged particles and could travel freely. 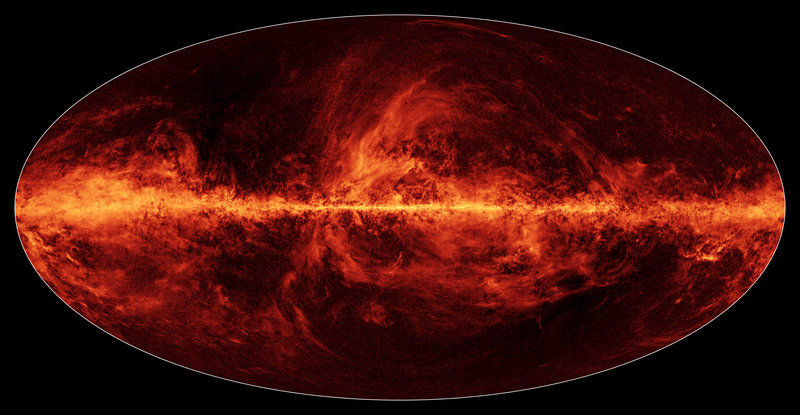 Our Milky Way galaxy is ablaze with dust in this new all-sky map from Planck, a European Space Agency mission with important NASA contributions. Planck’s splotchy maps of this light show where matter had just begun to clump together into the seeds of the galaxies we see around us today. By analyzing the patterns of clumps, scientists can learn how conditions even earlier in the universe, just moments after its birth, set the clumping process in motion. What’s more, the scientists can study how the ancient light has changed during its long journey to reach us, learning about the entire history of the cosmos. A big challenge for Planck scientists is sifting through all the long-wavelength light in our universe to pick out the signature from just the ancient cosmic microwave background. Much of our galaxy gives off light of the same wavelength, blocking our view of the relic radiation. But what might be one scientist’s trash is another’s treasure, as illustrated in the new map of the Milky Way released today. Light generated from within our galaxy, the same light subtracted from the ancient signal, comes to life gloriously in the new image. Gas, dust and magnetic field lines make up a frenzy of activity that shapes how stars form. More papers analyzing the data are expected to come out next year. Planck launched in 2009 and completed its mission 4.5 years later in 2013. NASA’s Planck Project Office is based at JPL. JPL contributed mission-enabling technology for both of Planck’s science instruments. European, Canadian and U.S. Planck scientists work together to analyze the Planck data. Posted in Astronomy, Astrophysics, Physics, SpaceTagged Awesome Cosmic Microwave Background Pictures, clusters of galaxies, CMB, cosmic, cosmic evolution, cosmic microwave background, cosmic microwave background Pictures, dark energy, Deep Space, ESA, European Space Agency, Galaxay, galaxies, History of Our Universe, Magnetic field, NASA, observable universe, Planck Mission, Solar System, stars, UniverseBookmark the permalink. Would Gender Differences Exist if we Treated People the same?